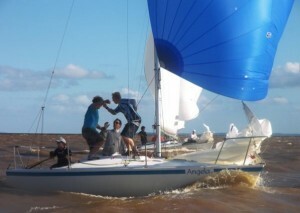 The J/24 Class Championship ended on Tuesday, Nov 1 in Porto Alegre with victory for the boat Angela VI, helmed by Henry Dias. Second was the Yucca, helmed by Claudio Ruschel with Bravissimo helmed by George Nehm third overall. All the winning teams hail from the “sailing south” of Brazil, home of the championship. The Brazilian Championship was hotly contested. The top two boats were tied in points, 17 each, after eight races leading to a showdown in the final race of the regatta. The crew of Angela VI had a good start and stayed in the top three in the fleet, while the Yucca had its worst performance in the championship, finishing seventh. The race was won by Bravissimo. When crossing the finish line in third, Dias secured the Brazilian Championship and celebrated long with his J/24 crew formed by Frederick Sidou, Alexis Knebel Goldmeier and Vilnius. They competed with a borrowed boat, but the team came together in the ocean on another ship class, C’est la Vie, which belongs to the master champion. “In some ways it was a surprise to our result. At the beginning we felt that we were walking around the well and would be second place, but everything worked out in the lane. We sailed well in the second race of the final day, with strong wind, and the title came to our hands, “said Dias, 23 years , who celebrated with champagne on arrival at the club. Murilo Borges, from the Yacht Club of Rio de Janeiro, finished fifth with his team and had the presence of his illustrious son, Gabriel Borges, the Gravedigger, who along with Alexandre Tinoco won the gold medal in the Snipe class in the recent Pan American Games in Guadalajara, Mexico. The fleet of Sailing South, will move soon to Argentina to attend the J/24 Class World Championship, 11-19 November at the Yacht Club Argentino. Crews confirmed so far are: Diferencial with Nelson Ilha, Yucca with and Claudio Ruschel, and Black Wind with Eduardo Ribas. More information and regatta photos can be found here.